New this year: a pair of warm running mittens will be given out to the first 300 entrants. Prizes for the fastest top three runners overall and top three Needhamites (male and female) and Free Raffle Prizes. Our route is USATF certified and will be professionally timed. Snacks and water will be provided after the run. I understand that running is a potentially hazardous activity, that the race course is not shut down to traffic during this event, that I should not enter this event unless I am medically able and properly trained, and I attest that I am physically fit and have sufficiently trained for this event. I assume all risks associated with participating in the event. 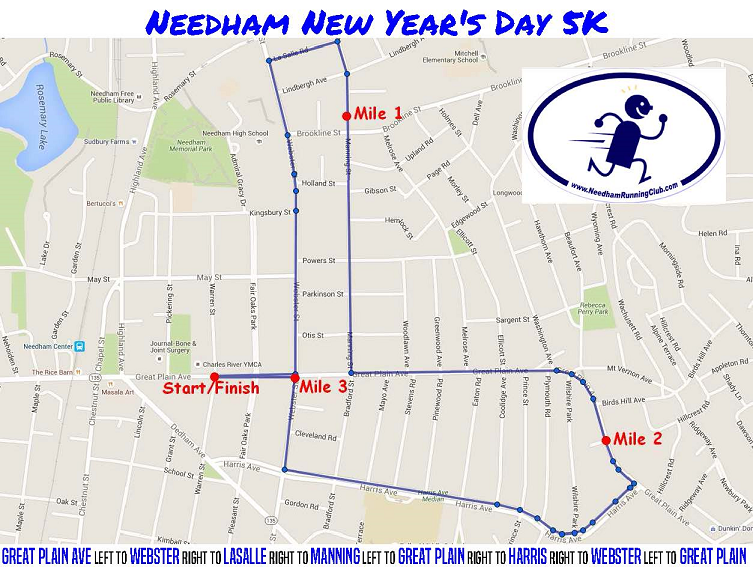 I, for myself, my heirs, assigns or anyone entitled to act on my behalf, waive and release the Needham Running Club and its officers, members, the Charles River YMCA, race sponsors, organizers, officials and volunteers. Their representatives and successors, from any and all claims or liabilities of any kind arising out of my participation in this event, even though that liability may arise out of negligence or carelessness on the part of persons or entities named in this waiver.